Sometimes mornings can be such a rush, getting ready to take the day head-on that breakfast can sadly be an after-thought. Well, no more my friends! 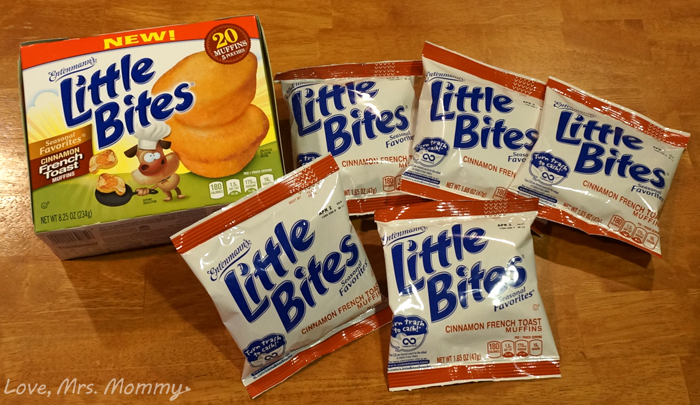 I have partnered with Entenmann’s Little Bites to bring you a fast, easy, and delicious breakfast! Little Bites are super yummy! I love all their delicious muffins, and this one is no exception. Their brand new Cinnamon French Toast Muffins are the newest addition to the Little Bites seasonal line and will be available starting February – May 2016. They taste just like the real deal, just in bite-sized muffin-form. Yum! A box of these treats contains five pouches, perfect for on-the-go mornings. Or, open up a pouch and place the muffins on a microwave-safe plate and microwave for 7 seconds on high. Then, presto!... you have scrumptiously warm muffins ready to devour. There are many ways to eat these tasty treats. In fact, Maureen Sticco from Entenmann’s bakery has shared fun and tasty DIY’s using the new muffins that the whole family will love. You can check out the Little Bites French Toast Breakfast Sliders, made with wholesome yogurt and fruit below. Entenmann’s has been making Little Bites for over 15 years! Every Little Bites pouch contains 0g trans fat, no high fructose corn syrup, are certified Kosher and most Little Bites are 200 calories per pouch or less! Connect: Find out more about Entenmann’s Little Bites by visiting their website. Then make sure you “like” them on Facebook. Buy It: You can purchase these Little Bites Cinnamon French Toast Muffins at your local grocery store and other retailers starting in February! Win It: One lucky reader is going to win the wonderful $40 RV prize package shown above! Items included are: Two boxes of Little Bites French Toast Muffins, Four Little Bites coupons (at $5.00 each) and 1 “I Love Little Bites” drawstring bag. This giveaway starts February 9th right here at LoveMrsMommy.com! What a great way to start the morning off. I have loved Entenmanns since I was a little girl. It's really comfort food! That is a great way to serve Little Bites for breakfast. This sounds absolutely delicious!! Love Entenmann's!! Sometimes I give my younger grandkids Entenmann's Little Bites for snacks rather than cookies. I will have to try the Little Bites Cinnamon French Toast Muffins. They sound awesome!! I love the taste of cinnamon, so I know I'd enjoy these tremendously! I love Little Bites, especially the snickerdoodle flavor. I also love Entenmann's Lemon Crunch Cake! I love Entenmann's products! They always taste great. I have even visited an Entenmann's bakery outlet nearby on a few occasions. Never had these smaller ones... Something new to try out. I love Entenmann's Little Bite Coffee Cakes. I love Entemann's, and I especially love the Little Bites! Yum! I love little bites! Our family LOVES Little Bites! We cant get enough! Delicious, love to try it Entenmann's always give us great bakery products. The Little Bites look like a delicious treat. Love Little Bites. Ju a t right for dessert or a snack. 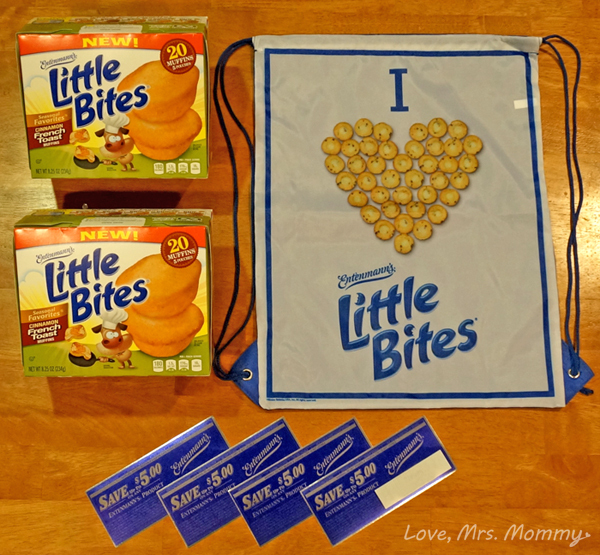 Love all Entenmann's products - their Little Bites are the perfect snack to take with you on the go!! We love Entenmann's, especially the Little Bites! I love Entennmans little bites and they are the perfect size and great if you are in a hurry! We love Entenmanns' chocolate donuts. These French Toast Little Bites look yummy. What a cool way to eat Entenmann's! Yum! Thanks for sharing! These would be great when you want a quick breakfast. These are really so delicious. I love the different flavors available. The ones we tried are so tasty, would like to try more flavors. these look so good. definitely something i would love, but maybe a bit dangerous because i wouldn't want to stop eating them.